In Dayton’s Bluff’s Heritage Preservation District, this was originally a 4-bedroom home with one bathroom. The Blacks (Chopper’s parents) purchased the property in 1952, and in 1961, added a first floor family room, basement bedroom and full bath, accommodating their 13 children. August 1998, major renovation began. 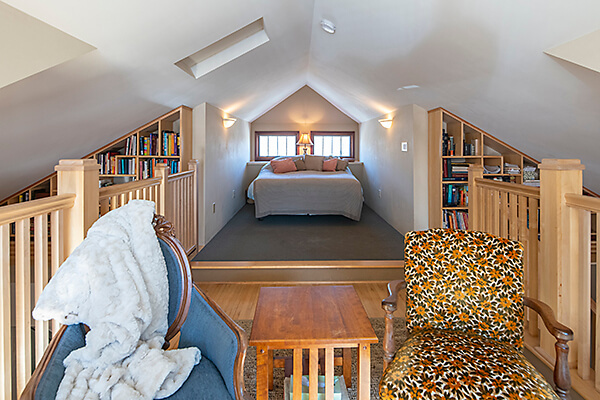 The roof was replaced, dormers were added and the second floor vaulted into unused attic space, creating a third floor loft. The main floor has been totally renovated over the last four years. The new design, now a wide open space minus a few walls, creating a lot of natural light, is a departure from a typical craftsman home but in keeping with the couple’s love of a more contemporary attitude.